Easy to grow and with attractive flowers from winter through spring, Zygocactus as we commonly call them are more correctly, Schlumbergera species. With only half a dozen species in the genus, the Schlumbergera varieties offered for sale owe a lot to intensive hybridisation. Commonly called the ‘Christmas Cactus’, ‘Holiday Cactus’ and ‘Crabs Claw Cactus’ we do prefer the botanical name, its not that difficult to pronounce. Grown for the brilliant flowers these epiphytic plants these cactus come from the rain forests of Brazil where they grow on the trunks of other plants. They love a little humidity and make great plants for growing in hanging baskets. Flower colour varies from white through to the brilliant luminescent pinks and purples, and as they flower in winter they add great colour to a patio or warm sheltered position while many other plants are dormant. The ‘Christmas Cactus’ name is from the Northern Hemisphere as this is when most species bloom, however, some will flower 2 months earlier than this. We think the best way to grow these plants is in a hanging basket, where they great specimens and grow well in a position where they get warmth and filtered light. 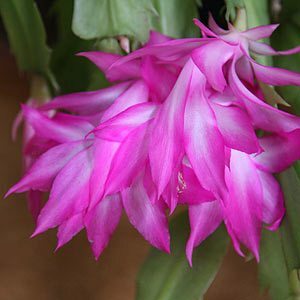 Schlumbergera are a succulent plant that are actually a cactus, sometimes referred to as ‘Crabs Claw Cactus’ they are actually epiphytes and require similar care to many orchids. How often should you water Christmas Cactus ? It depend on the climate and the soil. A general guideline is when the soil drys on the top. In warm climates, outdoors, every 3 – 5 days in summer, every 2 weeks in winter. Indoors, one watering a week, checking the soil before watering. These are a plant that do not require a lot of fertiliser or water. If you repot them every 3 years, you can get away with very little to no additional fertiliser at all. The best time to fertilise them is directly after flowering, in the spring. When you do feed them use a balanced fertiliser, not to high in nitrogen. You can use a little slow release type fertiliser at this time, around 1/4 to 1/2 the recommended amount. As an alternative, you can use a liquid fertiliser every 2 weeks after flowering, in spring until early summer as well as the slow release. After flowering is also a good time to prune these plants. Pruning encourages branching, more stems and therefore more flowers the next season. Usually to much light, place the plant in a well lit, however shaded area out of direct sun. Foliage going limp or wilting. This can be caused by to much direct light, under watering as well as over watering. Leaves shrivelling are also a sign founder watering. Foliage turning grey, yellow or brown is usually a sign of root problems due to over watering. Hold back on water and consider repotting the plant into a new potting mix which is free draining. This is another problem caused mainly by under watering, and sometimes by over watering. Schlumbergera truncata is the most commonly grown species, however it is the hybrids thats we see more widely for sale. Cultivars such as schlumbergera truncata madame butterfly pictured right are available for sale from specialist nurseries and plant fairs. Schlumbergera bridgesii is another popular species. Flowers and all buds need to be removed from cuttings so as not to have them taking energy from the cutting. You will fit 4 -5 cuttings in a 10 cm pot. Place the container in a cool dry position, frost free is essential. Label and date your cuttings so you know what you have planted and how long you have had it planted. Do not let the cutting dry out. – However do not over water. You can mist spray each week in cool weather, more often in warmer periods. In around 6 months the plants should be ready to pot up into a hanging basket. If you are looking for colour in a hanging basket in winter , then Zygocactus could be the plant for you. They have a tropical look to them, however are actually from the cool mountain areas of Brazil and they are naturally epiphytic, that is they grow on trees. Remember that they like a cool position in filtered light, in fact they can be reluctant to flower in full sun. They do need cool nighttime temperatures to get bud set, usually below 10 C, some extra shade in autumn will also help. They like good drainage, however they also like humidity, so in a hanging basket you need to provide both. They are best grown under cover, a patio, porch or similar. This gives the shade they need as well as preventing them from getting to wet in winter or any rainy period. In a hanging basket, the growing medium tends to dry very quickly, so we use a normal potting mix, we also line the basket itself with a little sphagnum moss so the growing medium does not dry out completely in summer. If you are growing them outdoors where they will get a lot of rain, use a cactus and succulent mix, the same thing if you tend to over water plants. Unless you have them in soggy soil, its fairly hard to kill them. We use a liquid seaweed fertiliser once every two to three weeks from when the flowers appear, right through to the end of spring. We also use a little pelletised seaweed fertiliser once a year, this seems to produce better flowers.